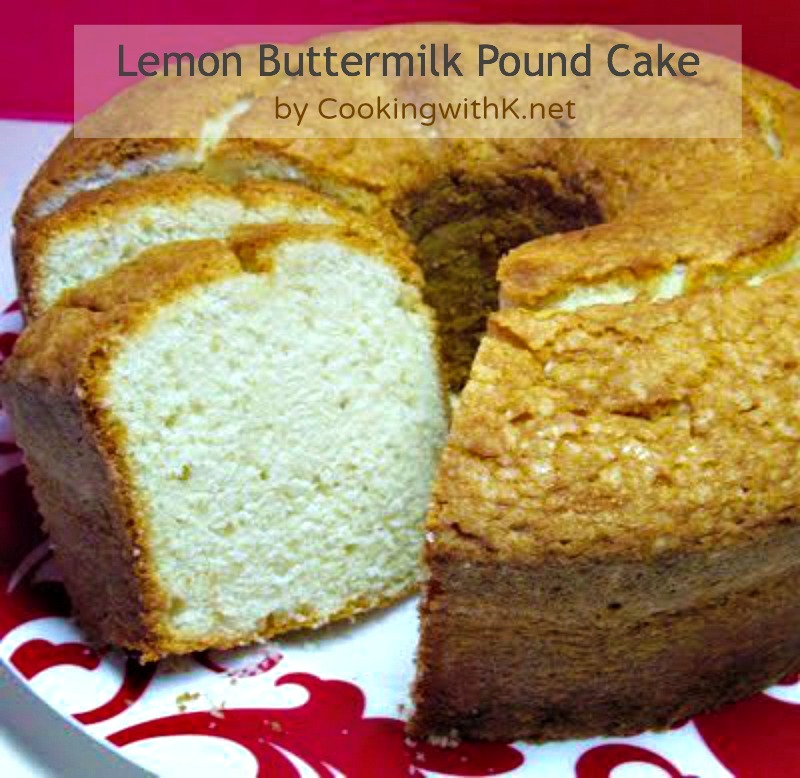 Buttermilk Pound Cake recipe goes way back to the 50's when my Mother started making it. The star of the pound cake is the buttermilk. 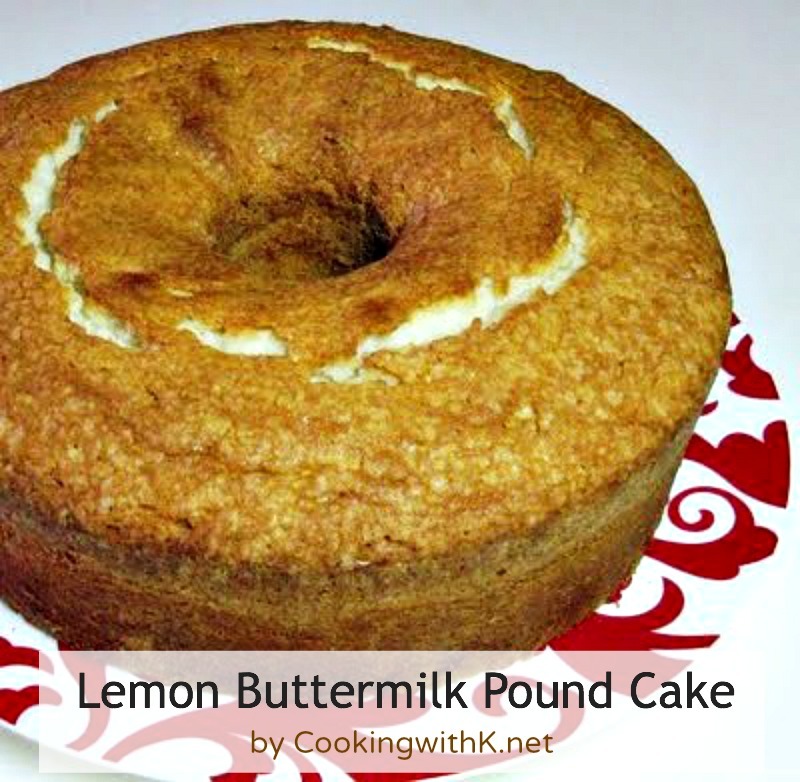 One of my favorite and dearest recipes that my Mother passed down to me is this delicious Lemon Buttermilk Pound Cake. 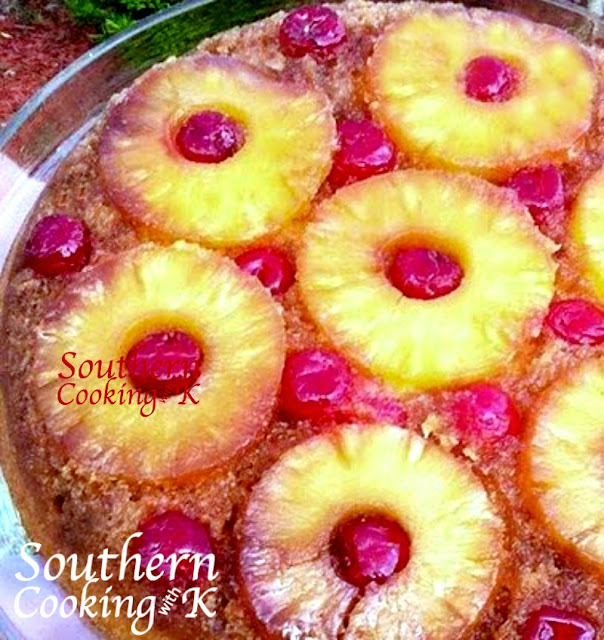 What is so special about pound cake is that it is great to serve in so many different ways. My husband likes his fresh out of the oven slathered with butter. My favorite is to put a big dollop of whip cream and sliced strawberries on it. Mother on occasion would serve it with a wonderful lemon sauce and chocolate sauce. You know at times, I talk myself into believing that this cake is low in calories and healthy when you eat it plain. Well, it doesn't have any icing on it, does it? "grins"! Cream shortening, butter and sugar until light and fluffy. Add eggs, beating after each. Add flavorings and water. Beat well. Add dry ingredients, which have been mixed, alternately with buttermilk. Pour into greased and floured pan and bake for 1 hour and 5 minutes. Bring to a boil: Juice and grated rind of lemons, sugar, and water. Note: My sister brought to my attention that Mother also would make it with 1 teaspoon of vanilla instead of 1 tablespoon of lemon extract and leave off the lemon syrup. If this is grannies recipe its got to be fantastic looks like you aced this one... love pound cake with strawberries and whip cream but yours doenst need anything! Grandma knew best didnt she! You are right she knew years ago what would still be in the category of grandeur! Thanks for sweet comment...you have a generation of excellent recipes too! Wow does this look like an award winning pound cake. Delicious! Some of the BEST!!! recipes are handed down and this one is AWESOME!!! My hubby loves lemon and this is a must try. It's been far too long since I'm have pound cake. Looks wonderful. Pound cake and fresh berries is a perfect spring and summer dessert! YUMM! This pound cake looks like it would be fantastic with some strawberries and whipped cream. 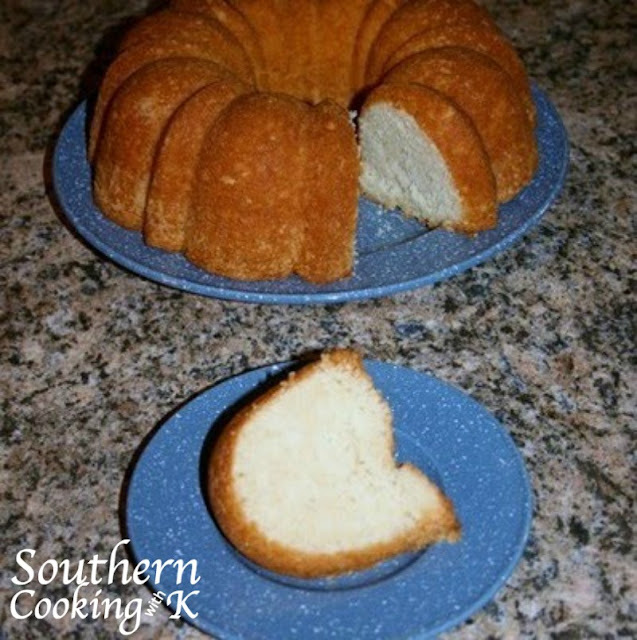 This is a most amazing pound cake and it became an immediate family favorite! Best pound cake ever! And you are right, it can hold it's own very well, or be a solid base for ice cream (my husband's favorite), or serve as bottom for a trifle, or....or....or....endless possibilities....my favorite still is as it is, pure and simple, straight from the oven....mmmmmh! This looks fantastic. You always have the best recipes! Thanks for sharing this family fav! That buttermilk is going to make this recipe so delicious. Those Grandma recipes are always the best! Hi K! I'm visiting via Fresh Food Friday. I'm so glad I stopped by your blog as I am always looking for new and delicious recipes. Thanks so much for sharing your granny's recipe! I can't wait to try it! I do love lemon. Just don't make anything lemon much or I would eat it all. My hubby is not much for lemon. Kids all flew the coop and grand kids all busy. I just eat lemon when I can limit my portions. This does look yummy. The print button is just below the share buttons and above the comments.